A Literary Odyssey: Weekly Wrap-up for November 18, 2012: Home Organizing and Bookshelf Questions. I'm personally an alphabetical organizer. For a few years there, Jason and I had our three bookshelves split into my books, his books, and the ones that we both wanted, but a few months ago, we got rid of about half our books, leaving us with maybe 300 or so total, and we integrated them all - fiction, nonfiction, poetry, his, mine, etc - into two smaller book cases, all organized by author. I like that. I'm afraid I'm not much one for keeping books longterm. I prefer to cull periodically. Never been good at collecting stuff. My book system goes largely by subject. I DO keep sets together for the most part--I have a Yale Shakespeare and a Durant world history for example. Literature is shelved alphabetically, fantasy and SF has its own bookshelf and so does my children's/YA lit. There are special shelves for mythology, biography, poetry, essays and letters, reference works, science, housekeeping, religion, and a large history section shelved chronologically. keep the classics in their collections and then alphabetically. As for the YA and Sci-Fi, I would do the same, genre based and then alphabetised. I love your new entertainment centre! In terms of organizing books I had the same problem when I moved. I organized everything by genre. My history books all went together but instead of alphabetizing them I put them in chronological order. All my classics are together, all the poetry. I basically have a fiction and a non-fiction bookcase and then everything else within the bookcases is separated accordingly. You should do whatever works for you, whatever makes things easiest to find. I alphabetise everything but I do keep collections together, because they look so lovely all lined up together on the shelf! Fantasy & sci-fi I would separate. I know what you mean about cleaning and getting behind with jobs around the house. We have both spent all day marking books today and neither of us has felt like hoovering etc.. I organize my books by genre and then alphabetically by author. (Exception being that any series is in numerical order). It makes me insanely happy. LOVE the entertainment center! 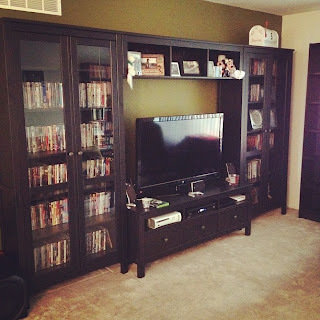 We need something like that - our DVDs are eating our living room. It may not work, depending on how well you know what your books look like, but (with the exceptions of collections like my Penguin classics and B&N Classics, which got their own shelves) when I moved and reorganized, I did everything by color and it looked SO AWESOME, like both interior art and displaying my books. But it wasn't the most useful if it came to finding something quickly, if that's your thing! I love the Hermes range, it's so elegant. Your room looks wonderful. Personally I put collections in with other classics, organised by publisher because Penguin classics look nice together etc. My other fiction books are organised by author, so I'm biased in the idea of mixing. I find it difficult to sort by genre when so many crossover. I stick all my fiction together, classics going in with everything else--which I've been rethinking lately, but with some "modern" classics it's hard to decide where they would go if I were to pull classics out. I have a "nonfiction" section also alphabetized by author, and then reference, then Sci/Fi Fantasy pulled out separately. I also have a separate religion/religious fiction section. Personally, I prefer to keep my genres separate. As my nonfiction section grows, I'm planning on separating it into sub-sections (poetry/history/general nonfiction/etc). I like the idea of sorting history by chronology rather than author. Reading your post and the comments, I realize I'm in the minority here, since my books aren't organized at all. Until my redecorating though, I could have found any book I wanted quite easily, being able to picture their position on my shelves. No-one else can find anything, but I think that's part of the plan since I'm very protective of my books. I do admire all your organization, but I think in this house happy anarchy will continue to reign. I have mine organized by category (classics, YA, nonfiction, GN, fastasy/sci-fi, etc) and then each category is alphabetize by author. I have my pretty Penguin hardcovers on a separate shelf because I just love them. Let us know how you end up doing it! I don't know if I'm book-organizing obsessed because I work in a library, or I just enjoy my job because of my bookish ocd. Here's what I do: I have two sets of shelves and a set of built-ins. I keep poetry, plays and short story anthologies across the tops of the shelves. Then non-fiction in loose LC order. Then fiction alpha by author. I have a few presses I collect (NYRB and Virago) and those I pull out and put on the built-ins. My rule is that more than 12 constitutes a collection that can be pulled out separately. If I ever get my oxford or penguin classics to over a dozen then I'll pull those out and put them on my "collections" shelf. Have you ever observed that no matter how many times you try to organize your things, they still end up everywhere? I live with my parents and I organize our home for them. Unfortunately, they like to leave things everywhere in the house so I have to clean up after them. It's tiring at times, but I like organizing the home anyway. Now, I'm off to buy a few more containers for mom's collection of ceramic dolls.